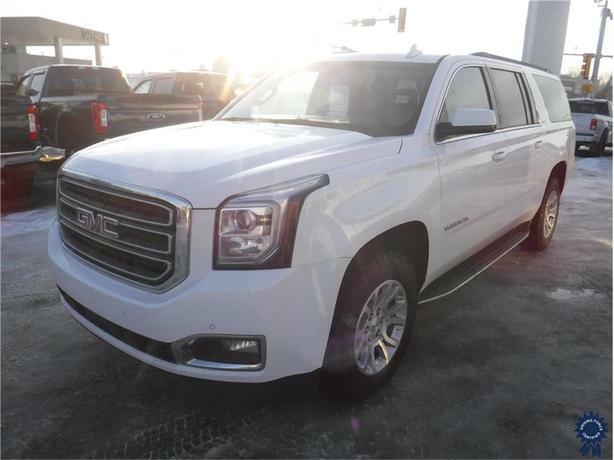 This 2017 GMC Yukon XL SLE 8 Passenger 4X4 SUV comes with a 6-speed automatic electronically controlled transmission, 3.42 rear axle ratio, 18-inch wheels, front 40/20/40 split bench seat, cloth seat trim, 8-inch Diagonal Color Touch Screen with IntelliLink, engine block heater, integrated trailer brake package, HD Trailering Package, black recovery hooks, rear power liftgate, power-adjustable gas and brake pedals, inside rearview auto-dimming mirror, 150-amp alternator, power steering, powertrain grade braking, Bose premium 9-speaker system with subwoofer in centre console, remote keyless entry, cruise control (electronic with set and resume speed), power door locks, tire pressure monitoring system, and rear vision camera. The 5.3-litre EcoTec3 V8 gas engine provides 355 horsepower at 5,600 RPM and 383 lb-ft of torque at 4,100 RPM. Touch base with us to discuss purchasing or financing options that are right for you and experience the difference you will only find at DRIVING FORCE Vehicle Rentals, Sales and Leasing.